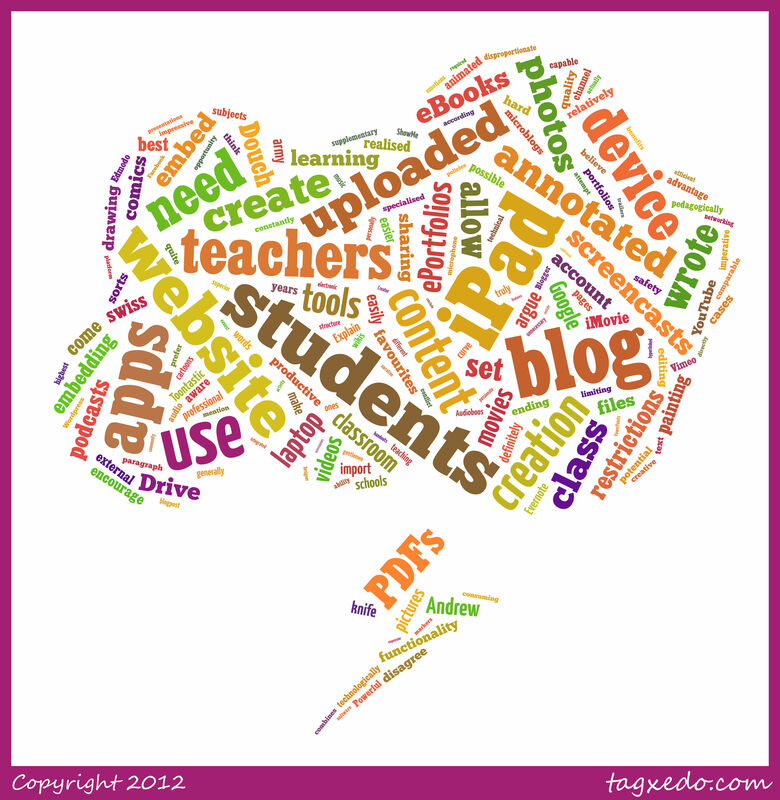 iCreate: How the iPad facilitates content-creation in the classroom? We’ve had computers in schools for years, but in reality many (most?) classroom teachers don’t and never did have their students making podcasts, movies, eBooks and websites. Doing so seems too time consuming and for many non-technical teachers the learning curve appears disproportionate to the benefits realised. Blogs/websites: I use the WordPress iPad app, as well as the Blogger app for blogging. Generally, I set up the accounts for the students using a class gmail account (due to age restrictions and safety reasons). On a blog, you can have pages, and sub-pages, and you can embed videos, screencasts, photos, files (through Google Drive, for example) and much more, which essentially means it can be both a blog and a website. Screencasts: My favourites are definitely ShowMe and Explain Everything. ShowMe has the advantage of being an online learning community, and screencasts can be uploaded on a ShowMe profile and then later on embedded on a blog or website. Explain Everything has the advantage of being able to import media such as PDFs or PowerPoints/Keynotes, and annotate over them while recording voice. However, Explain Everything screencasts may need to be uploaded on YouTube or Vimeo first in order to embed them on a blog/website. Movies/videos: I believe iMovie is by far the easiest to use (though many others disagree). My students use iMovie to create trailers, edited videos, short movies, and photo presentations with music and text. I think all that is quite enough for a classroom activity or task in any subject. Again, uploading these videos/movies on a class YouTube or Vimeo channel can allow embedding them on a blog/website/wiki. Podcasts: My favourite is Audioboo (but there are many others out there like using Audio Memos along with a Posterous account). 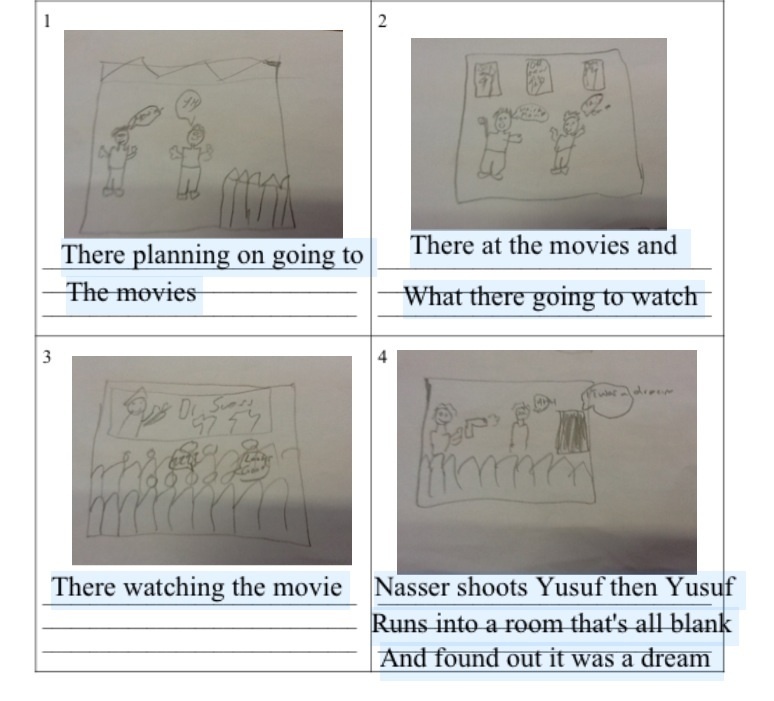 My students record their Audioboos and then embed them on their blog/website. Some students also prefer using GarageBand to record audio files, and then import them into iMovie, where they add a picture or some sort of visual element. 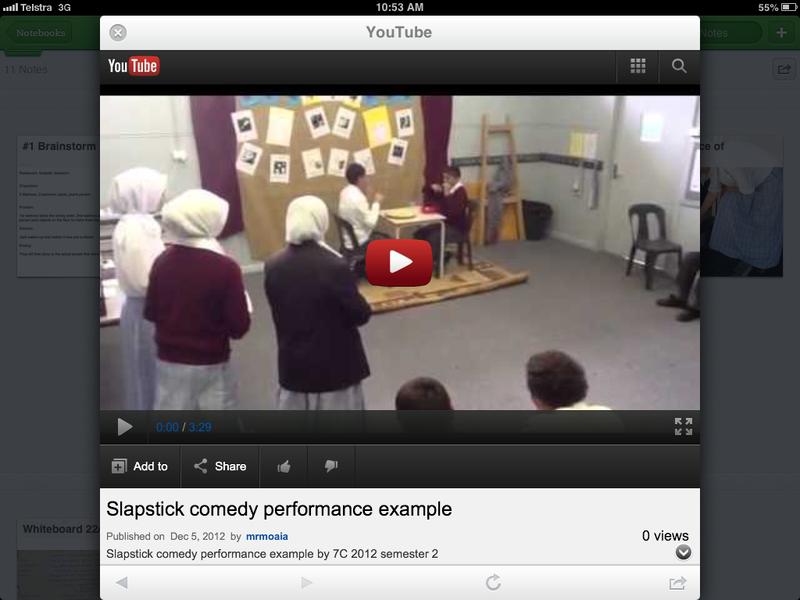 The students would then upload the podcast onto the class YouTube channel and embed it into their blog/website. 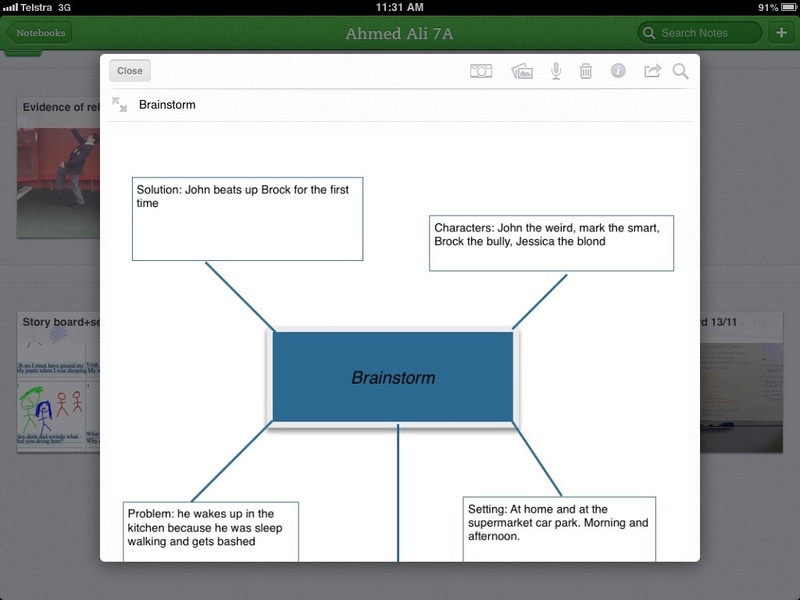 eBooks: I prefer to use Book Creator because it is easy and relatively efficient. You can also embed all sorts of media into your eBook, which a lot of students like to do. eBooks can then be uploaded onto the students’ e-portfolios, or even embedded/hyperlinked onto their blogs/websites. ePortfolios: A blog, wiki or website can definitely be used as an ePortfolio. But for teachers who may be quite wary about age restrictions or the safety of their students, Google Drive offers huge potential for creating ePortfolios. Just by setting up folders and sharing them with the teacher/s, along with the Google Drive iPad app’s ability to upload all sorts of media (using ‘Open in another app’ functionality from most apps), the student can easily create and share an ePortfolio with the teacher. 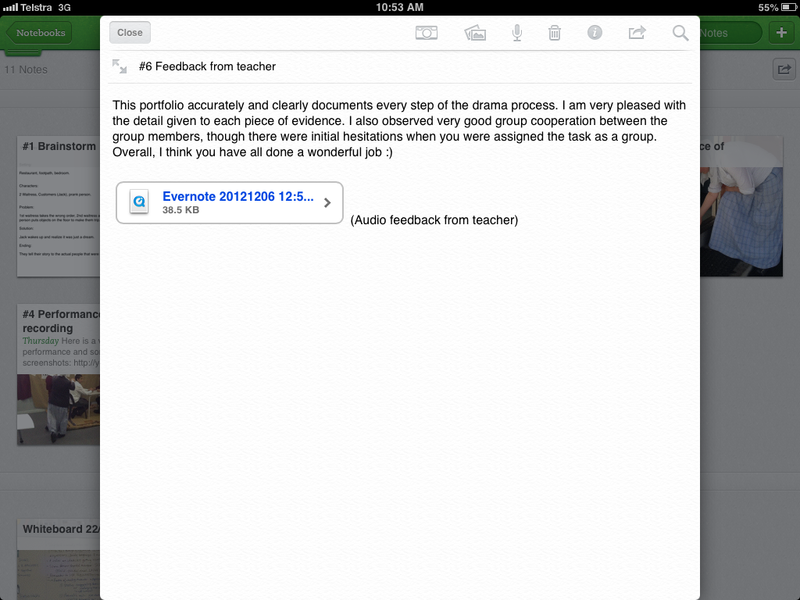 I have also used Evernote in many of my drama classes and I am a big fan of using Evernote for creating ePortfolios. 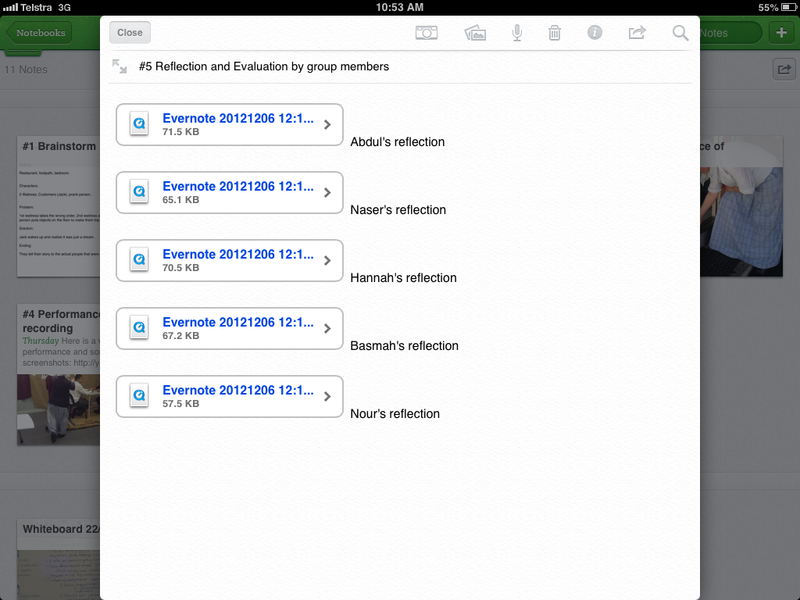 However, I needed to set up an Evernote premium account and many teachers may refuse to do so. Animated cartoons: I have three favourites here: Puppet Pals, Sock Puppets, and Toontastic. However, the best in teaching narrative structure is Toontastic, as there are different scenes: set up, conflict, climax, ending, and you can also add music to create different moods/emotions etc… I love using it with my four-year-old nephew just to get him to think about how to structure a story. Toontastic also allows uploading directly on ‘ToonTube‘, and then embedding on a blog/website. 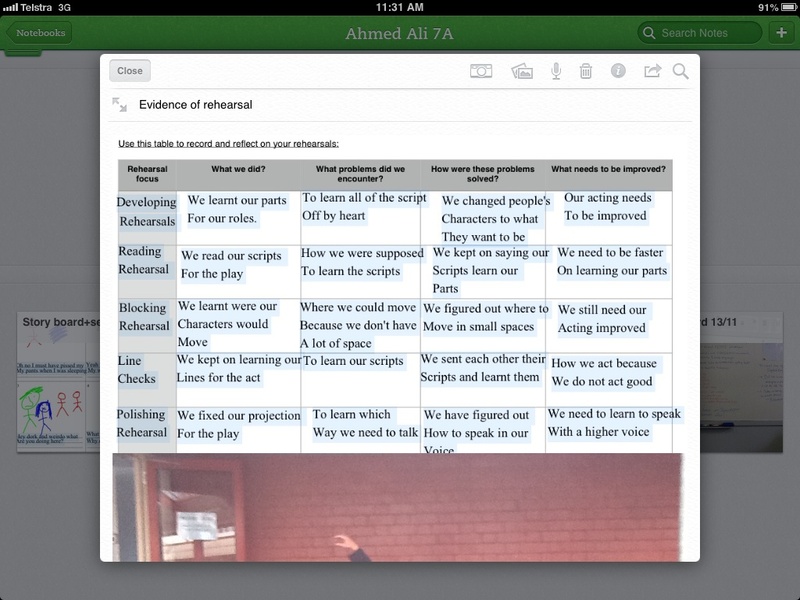 Annotated PDFs/Photos/Pictures: I use Notability for annotating PDFs and Skitch for annotating pictures/photos. Both can produce content that can easily be integrated with Google Drive/Evernote and thus added to the student’s ePortfolio. 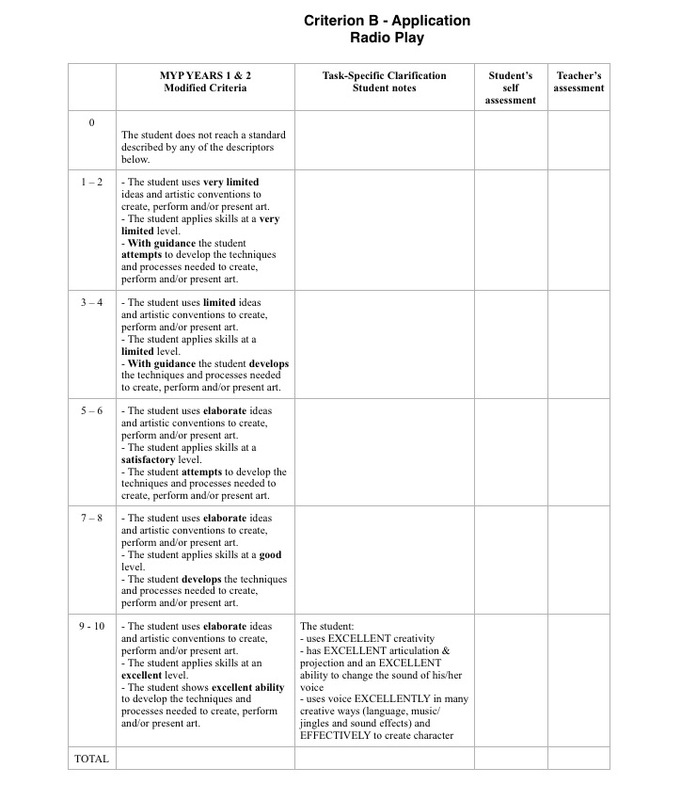 Worksheets and handouts can now be shared with students as PDF files and then annotated using text, highlighters, markers, pencils, images or shapes, and that is a useful function for all subjects. Microblogs: I am a big fan of Edmodo, and I am a passionate user of this learning platform. Edmodo can now also make iPad workflow much easier after a recent app update, where files can easily be uploaded through the ‘Open in another app’ functionality. Teachers can also use Twitter and Facebook for micro-blogging in the classroom, but most social-networking policies in schools place many restrictions and challenges when it comes to these tools. Comics: I often use Strip Designer or Zoodle Comics to encourage students who wish to create comics. 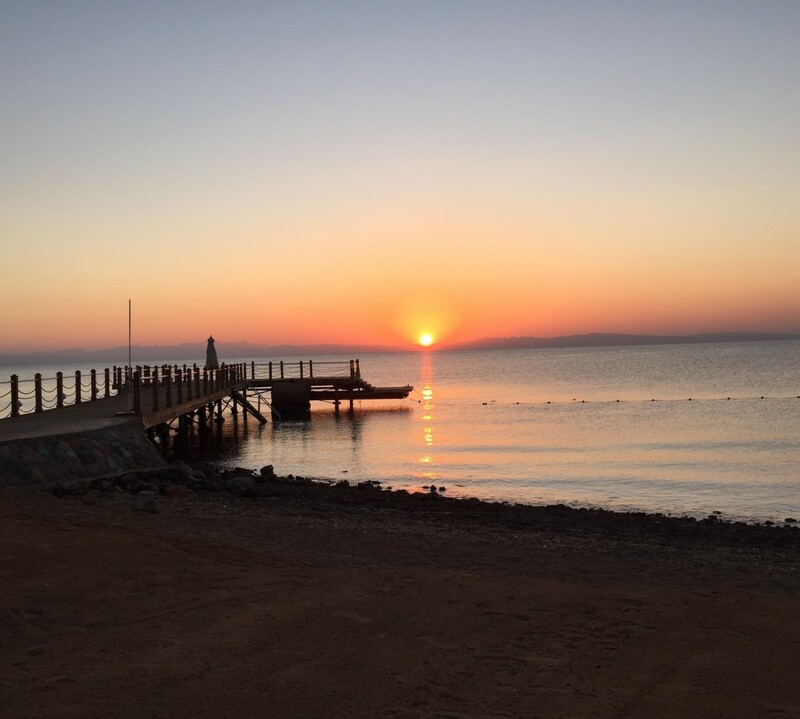 Both apps also allow sharing in PDF formats or into the Photo Library/Camera Roll, which can then easily be uploaded on Google Drive or embedded in blogs/websites. Drawings/Paintings: I have not used many drawing/painting apps, but I generally encourage my students to use Art Set or Penultimate. There are many more, with more specialised features as well. Again, all output can be exported, shared and embedded on blogs/websites. To conclude, I would like to restate: I am not arguing that only the iPad can allow such content-creation in the classroom, but I do believe these creations are much easier to produce on an iPad than on a laptop or desktop computer (where additional accessories are often required, along with expensive specialised software). The iPad truly is ‘a swiss army knife of content-creation tools‘ as Andrew Douch wrote, and with these words I encourage you all to go forth and iCreate. Slapstick Comedy: wrapping up the drama process! 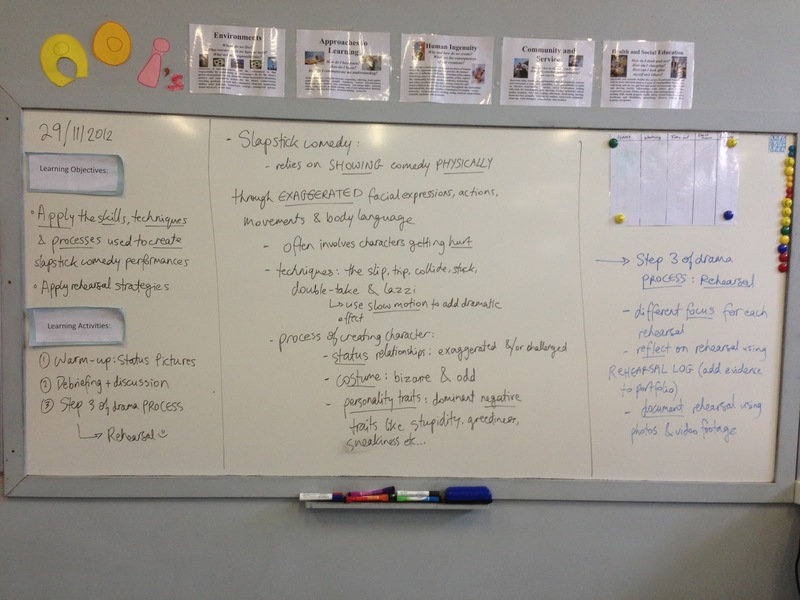 This term, the year 7 and 8 classes studied a unit of work on ‘Slapstick Comedy’. I have posted previously about how we explored the concept of humour in general, and how we defined slapstick comedy. Three weeks ago, we kick-started the drama process and began brainstorming for our performances, and we had the opportunity to write up the scripts and draw up the storyboards for the performances. We also had the opportunity to rehearse for our performances. Last week, we finally had the opportunity to wrap up this process and move into the final two steps: ‘performance’ and ‘reflection & evaluation’. The lesson’s warmup was a quick physical and vocal warmup followed by a final run-through rehearsal outside in the courtyard. After that, the students formed an audience and we watched every performance. The audience were asked to give feedback to each group of performers in the form of positive comments or useful suggestions for improvement. Each performance was recorded using the iPad for documentation purposes, and also to help the performers themselves reflect on and evaluate their own performance skills (as it is much more meaningful to see yourself acting in order to spot your strengths and weaknesses, and hence reflect on them). After all performances were presented, the students were given a chance to view their short slapstick scenes, and then use the reflection help-sheet to write their four-sentence reflections and the task-sheet evaluation checklist to evaluate the process as well as the final product. 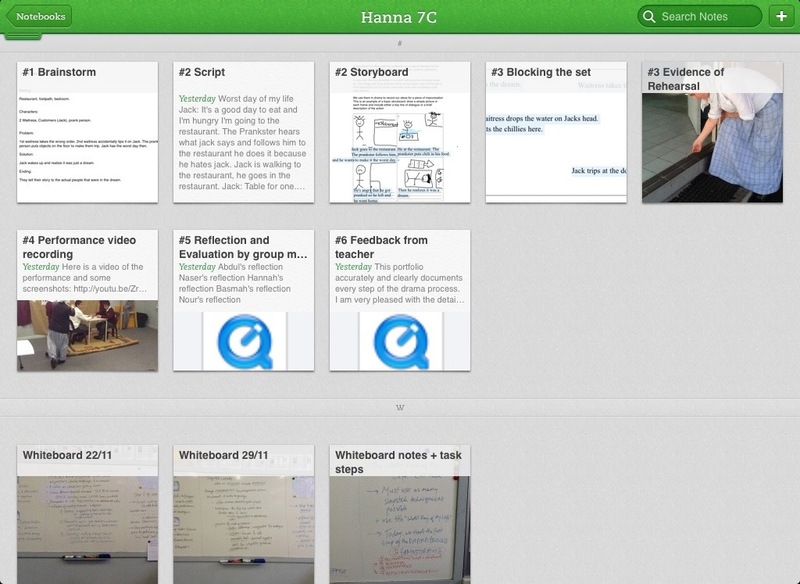 For the year 7 classes (who have iPads), I allowed them to record their reflections orally and attach them to their Evernote group-portfolios/shared-notebooks. After the lesson, I looked through all group-portfolios and I attached my written and oral feedback, and final assessment. Overall, I think the task was very engaging for the students. 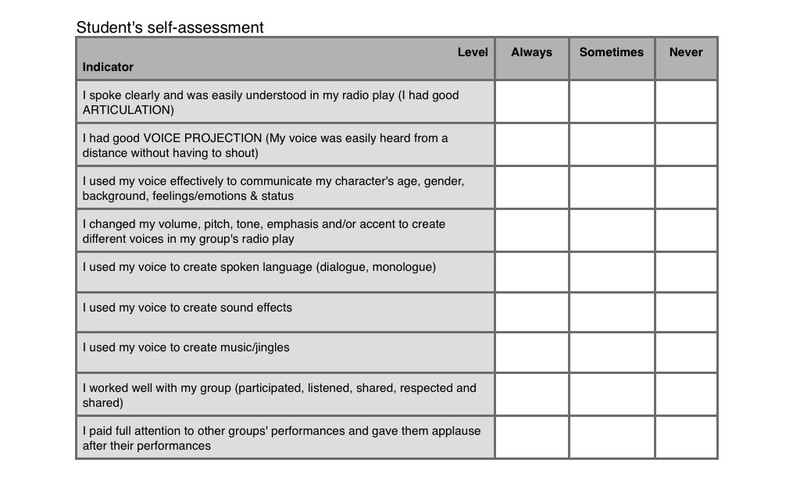 This was the first task where I agreed to allow some students to just be writers and directors for their group’s performance, as many students did not really seem to enjoy performing or were too self-conscious. I believe these students were a lot more engaged with the task. Below you will find a video-tour of one of my year 7 portfolios for this task, followed by some screenshots of evidence attached to the some group portfolios to document every stage in the drama process: brainstorming, preparation (script-writing/story-boarding), rehearsal, performance, reflection & evaluation. And this, ladies and gentlemen, concludes our year in the drama classroom! Summer here we come! Slapstick Comedy: Step three of the drama process! 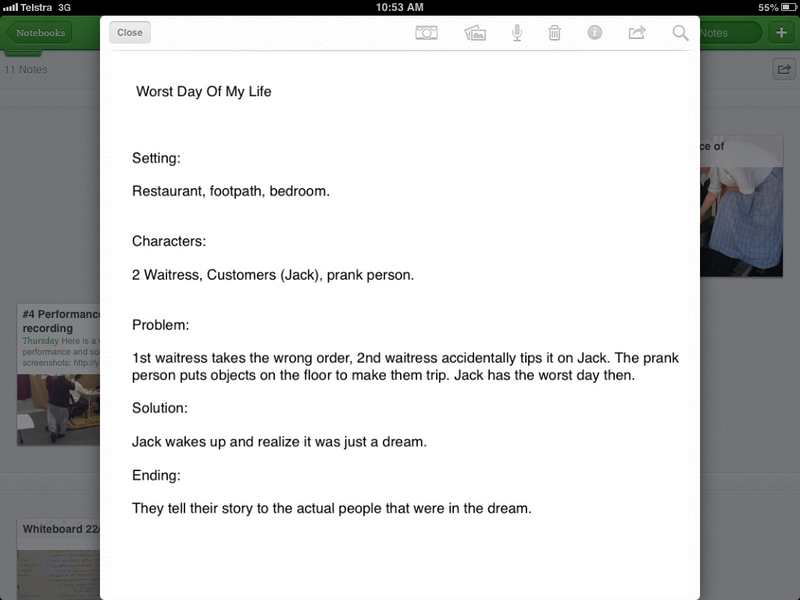 The year 7 and 8 classes are studying a unit of work on ‘Slapstick Comedy’. I have posted previously about how we explored the concept of humour in general, and how we defined slapstick comedy. Two weeks ago, we kick-started the drama process and began brainstorming for our performances, and we had the opportunity to write up the scripts and draw up the storyboards for the performances. This week we moved on to step three of the drama process: rehearsal. The lesson started with a quick warmup called Status Pictures, where the students form still-images depicting situations involving characters of different status. This warm-up was chosen to get students thinking about status relationships and how they are used in slapstick comedy to create humour. 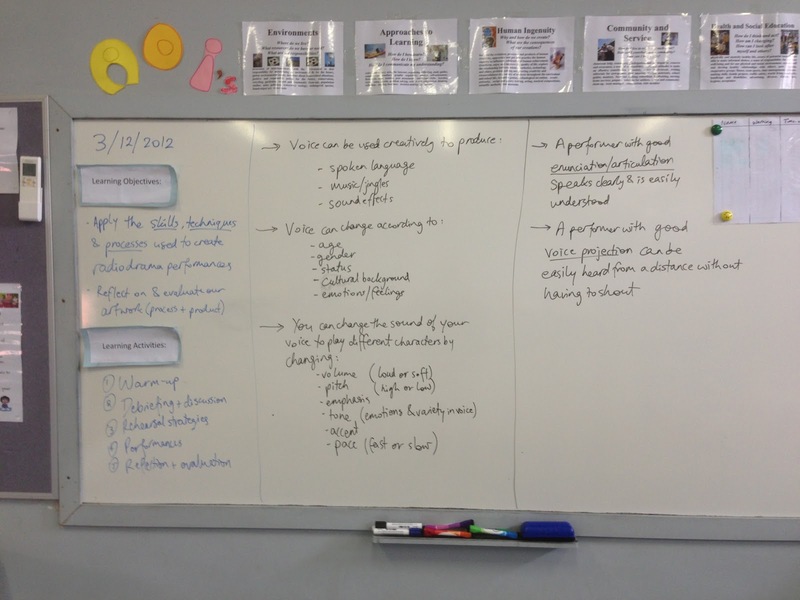 After the warmup and debriefing session that followed, I recapped on the theoretical part of the unit which was written on the whiteboard (pictured below); then the students moved into their groups (or ‘theatre companies’) and were each given a rehearsal handout (A4 size) and an A3 size Rehearsal Log. 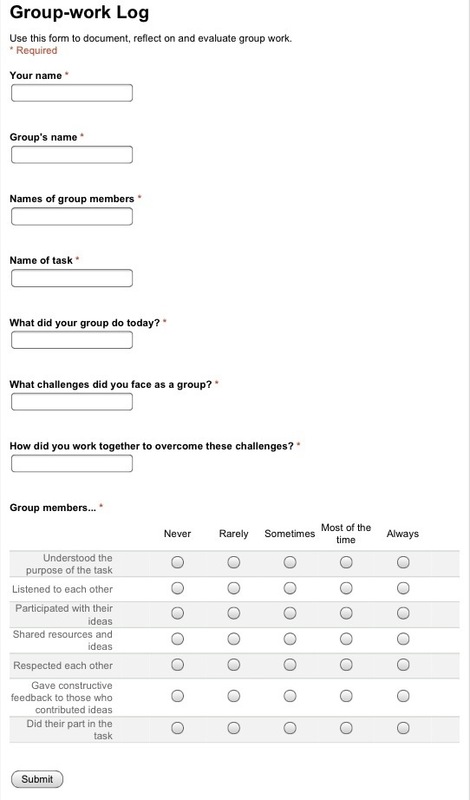 I circulated around each group to check their progress and to recap over the rehearsal process: what is its importance and how can it be used effectively? The students spread around the drama room (some groups moved outside into the courtyard) and they each rehearsed a few times. The groups were told to choose a different focus for every rehearsal (e.g. 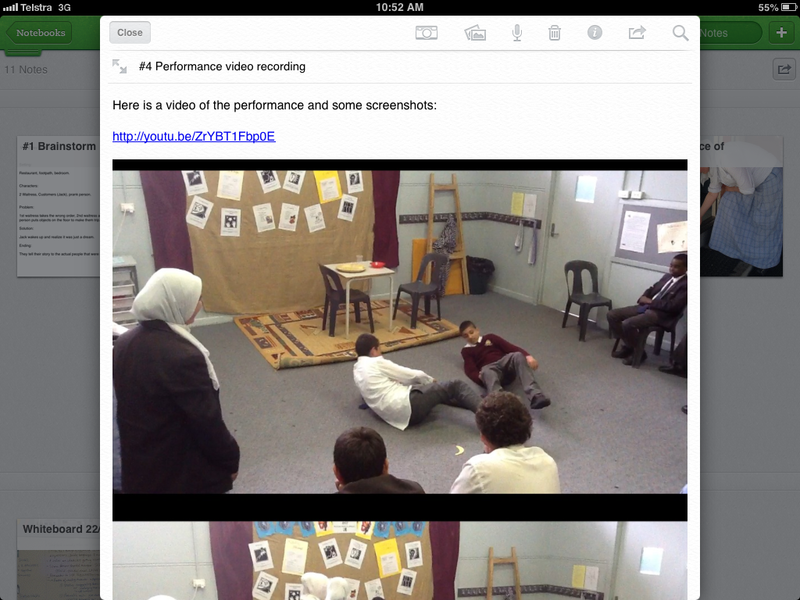 body language, or blocking, or voice etc…), to fill out the rehearsal log after every rehearsal to reflect on it, and to document their rehearsals with photos and some video footage (using smart-phones/iPods for year 8s, or iPads for the year 7s). 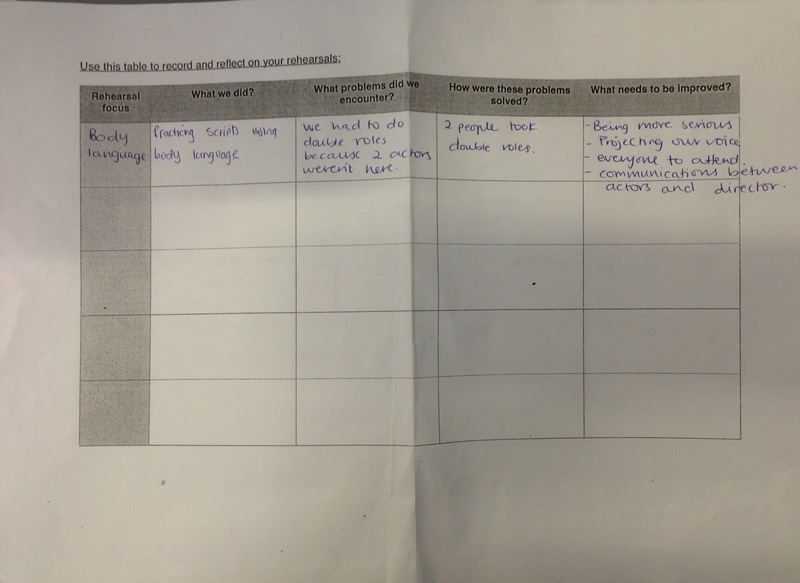 The students were also told to keep evidence of their rehearsal in their portfolios: e.g. annotated pictures from rehearsal (printed from classroom printer) and the rehearsal log. 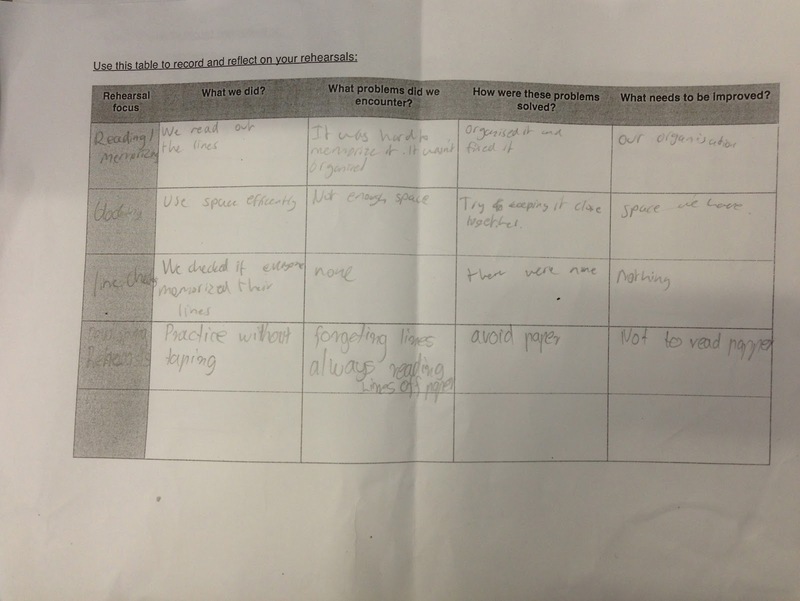 For the year 7 students, who all have iPads, this evidence was just added to their shared Evernote notebook which they used as their group portfolio. The rehearsal process seemed to go rather efficiently, and everyone had a meaningful role as each student was either acting out in rehearsal, or taking photos/shooting video, or filling out the rehearsal log. The groups also seemed much more committed to the rehearsal process due to of having a different focus for every rehearsal. 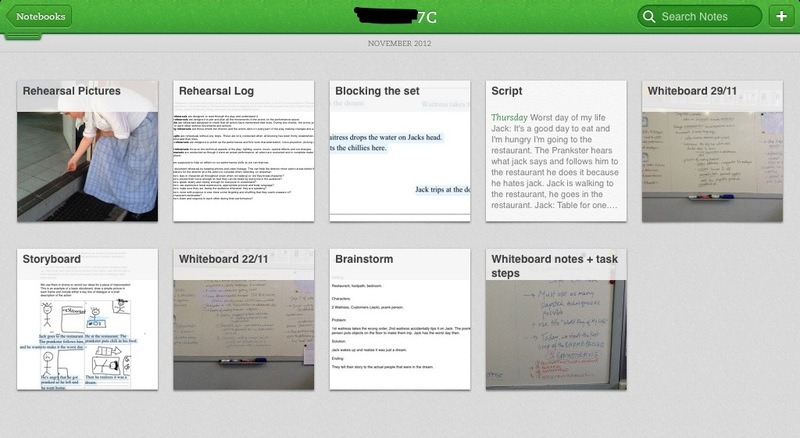 Below are some snapshots of the rehearsal logs of a couple of ‘theatre companies’, a snapshot of the whiteboard, and a screenshot of an Evernote portfolio from one of the year 7 groups. 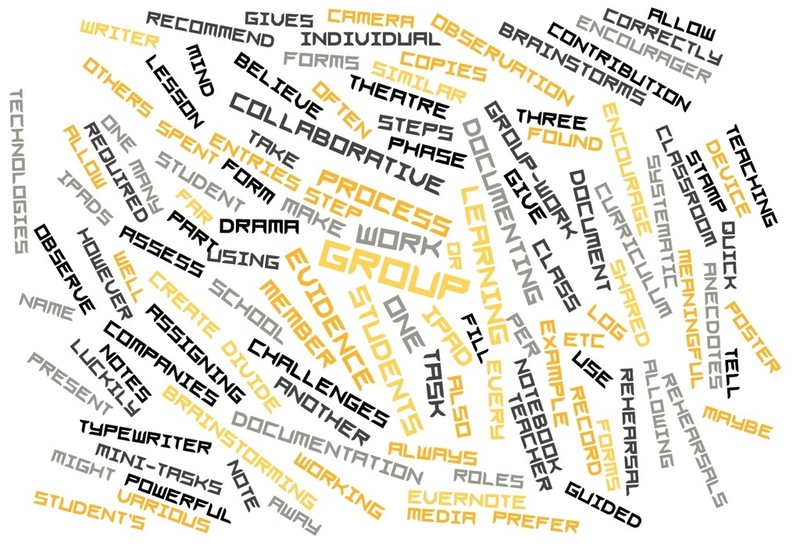 Next week, we move into the final two steps of the drama process: performance, followed by reflection and evaluation. Stay tuned ladies and gentlemen!